This anthology, drawn from the autobiographies of seven men and women whose lives span the nineteenth century, provides a rare glimpse of the everyday lives of workers in the age of early industrialization in France. Appearing for the first time in English, these stories vividly convey the ambitions, hardships, and reversals of ordinary people struggling to gain a measure of respectability. The workers' livelihoods are diverse: chair-maker, embroiderer, joiner, mason, silk weaver, machinist, seamstress. Their stories of daily activities, work life, and popular politics are filled with lively, often poignant moments. We learn of dismal, unsanitary housing; of disease; workplace accidents; and terrible hardship, especially for the children of the poor. We read of exploitation and injustice, of courtship and marriage, and of the sociability of the wine-merchant's shop and the boardinghouse. 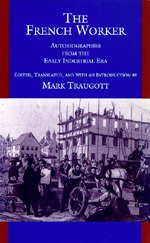 Traugott's analytic introduction discusses the many shifts in French society during the nineteenth century. Used in combination with other sources, these autobiographies illuminate the relationship between changes in working conditions and in the forms of political participation and protest occurring as the century came to a close. Mark Traugott is Professor of Sociology at the University of California, Santa Cruz, and the author of Emile Durkheim on Institutional Analysis (1978) and Armies of the Poor (1985).